“Divine race of the heavenly fish preserve a pure heart having received among mortals the immortal source of divine waters. 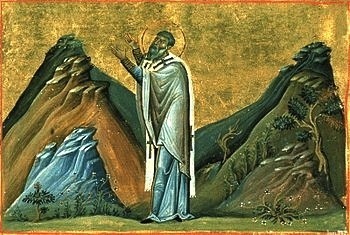 Refresh, O friend, your soul with the ever-flowing waters of treasure-bestowing wisdom. Receive the sweet food of the Savior of the saints. Eat with delight holding the fish in your hands. Nourish with the fish, I pray, Master and Savior. Sweetly may mother slumber, I beseech You, Light of the dead. 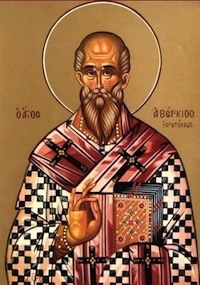 Ascandios father, beloved of my heart with sweet mother and my brothers in the peace of the fish, remember Pectorius.” Nothing is known of Pectorius. Because of its paleographic characteristics, the tablet is dated c. 290. The first five lines in this Greek inscription begin with the Greek letters “I, CH, TH, U, S,” Ichthus, Fish, Christ. 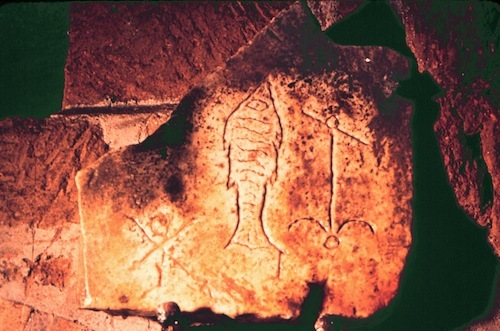 Pectorius closes his inscription “in the peace of the fish.” Clearly, the symbol of Christ as Ichthus, as the Fish was known in France as well as in Rome from earliest times. 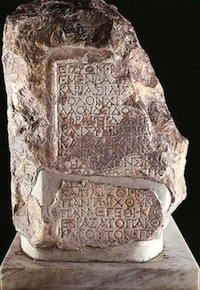 Pectorius’ Inscription has, also, provoked controversy. He mentions “holding the fish in your hands” during the Lord’s Supper (also called Holy Communion and the Eucharist). 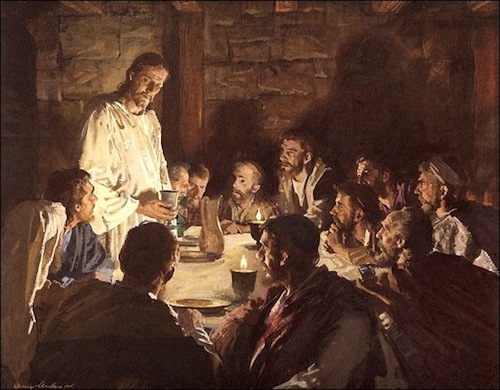 The modern Eucharist (from the Greek eucharistia meaning “thanksgiving”) is composed of two elements, the bread and the wine, not of three elements. 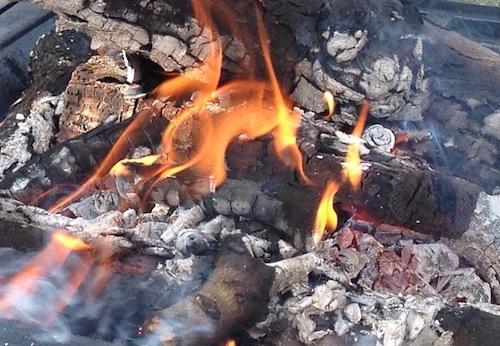 Mysticism, metaphor, reality? 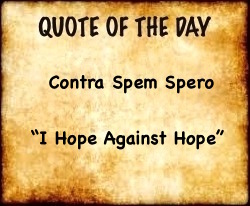 Or perhaps Pectorius meant that the bread and the wine together compose the Body of Christ, the Ichthus or that Christ/Ichthus is “present” at the Eucharist? What to make of Pectorius and Abercius? Certain it is that modern-day Christians who place stickers of a fish or of the word “ICHTHUS” on the bumpers of their cars or who wear a fish around their necks as a symbol of their faith are not thinking of Abercius and Pectorius. 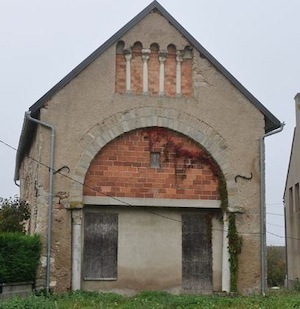 But the ancient acrostic and the symbol of Christ as Fish are powerful and have survived. 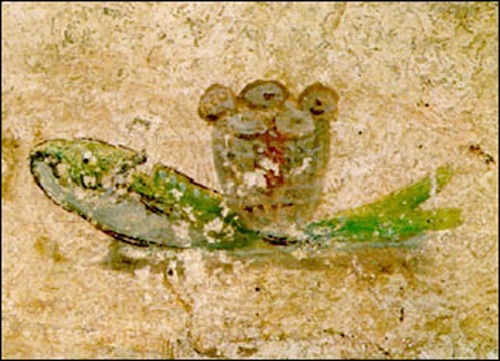 There are many frescoes in the catacombs connecting fish with the celebration of the Eucharist. In the Catacomb of Callixtus in the Cubicles of the Sacraments there is a unique representation of the imposito manum, the “laying on of hands,” the blessing of the Communion bread. A tripod/altar holds a loaf of bread and a fish. 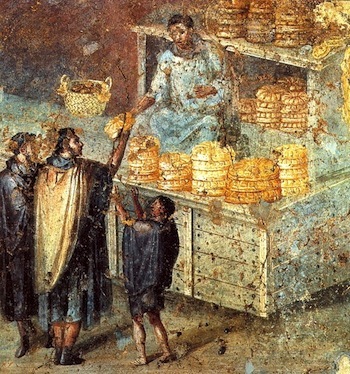 A man is laying his hands on the bread. A female on the right has her hands raised in praise. 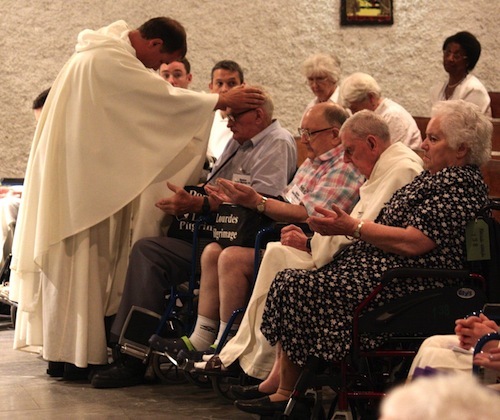 In modern days the laying on of hands still accompanies most celebrations of the Last Supper. There is another tripod in the same Cubicle with bread on it and seven baskets full of bread on the floor. The most interesting fresco relating to Communion in Callixtus is in the Crypt of Lucina (c. 180). Two large fish face each other, each bearing on its back a wicker basket overflowing with loaves of bread. Each basket contains a cup of red wine hidden among the loaves. 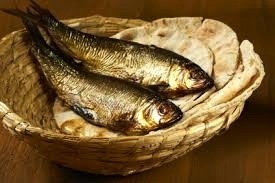 Bread, wine and fish, as metaphor or as a part of the early sacrament? 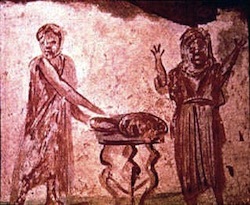 All three were depicted on the table at early Christian Communions in catacomb art. “No,” they answered. 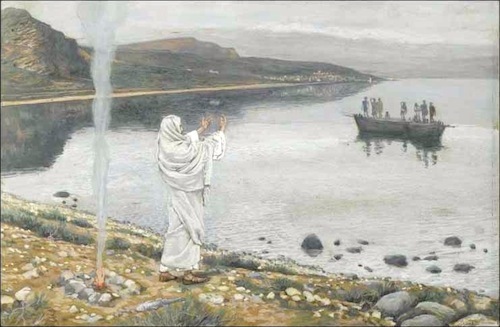 He said, “Throw your net on the right side of the boat and you will find some.” Some fishermen on the Lake used a dragnet hundreds of feet long, but Simon and the disciples were probably using a 55 square foot circular fishing net. 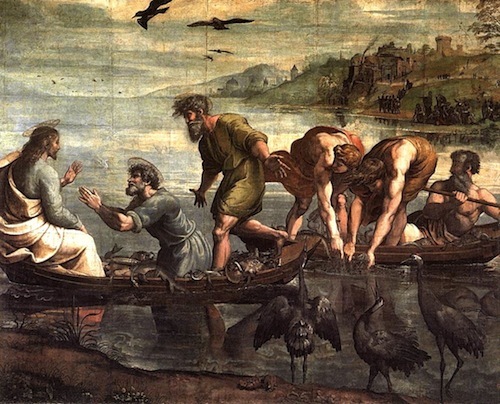 They obeyed Jesus and caught 153 large fish. Rather than emphasize Jesus’ sacrifice on the cross as the Passover meal in the Upper Room did, this seaside breakfast obviously included the command to “go fish,” to evangelize. It included a miracle of fish, the fishermen, the Great Fisherman Himself, fish and bread.